It’s certainly hard to leave “Here to Stay” – a beautiful 4 bedroom vacation rental with a gracious open floor plan and plenty of neighborhood and at-home amenities. 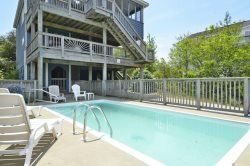 Get lost in your favorite book out in the screened porch, wind down after a fun day at the beach in the hot tub, or lay back on the deck furniture and soak up the sun while enjoying the fresh ocean breezes on the large sun deck. Beach access is only 0.5 miles from your back door, golf at the Currituck Club is only 2 miles away and Timbuck II shopping center is only a mile away. When all these little extras are combined, there’s clearly no limit to the fun that awaits you at Here to Stay. It’s simple to find a quiet corner or grand gathering spot within Here to Stay, thanks to a beautifully planned layout where the natural light creates a bright and sunny atmosphere. Relax in one of four tastefully appointed bedrooms, or reconnect in the grand great room with a cozy living area, complete kitchen and breakfast bar, and spacious dining area. The beautiful cathedral ceilings give a wide-open feel and access to the upstairs loft that overlooks the central living area, while the outdoor hot tub will be a favorite destination for weary visitors who need to forget about the stresses of everyday life. With chic and beachy decor and plenty of amenities, Here to Stay is a home that will certainly linger well after your vacation is over. Enjoy breezy beach trips that are complemented with ample family time, and make your escape to this cool corner of Corolla for miles of fun. Top-Level: Loft with Bunk Bed. Mid-Level: 3 Queen bedrooms, bedroom with 2 Twins, 2 full baths and great room with Living area, dining area and kitchen.